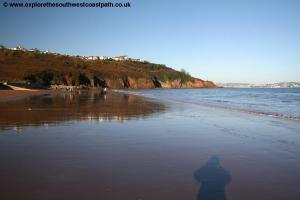 This walk starts in the popular resort of Paignton, passing it's pier and harbour and the good beaches at Goodrington and Broadsands. From Broadsands the path goes into countryside, passing the quiet and attractive Elberry Cove before emerging into the busy harbour at Brixham. The A380 is the main trunk road to Torbay. Follow this passing Newton Abbot and the turn for Torquay and continue to the junction with the A385 and A3022. 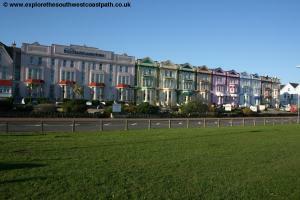 Here turn left onto the A3022 and follow this into Paignton, where the are several car parks. From the direction of Plymouth you might prefer to leave the A38 at the South Brent turn onto the A385 and follow this through Totnes to Paignton, and then take the A3022 as above. If you are coming by public transport, Paignton has a station which has between 1 and 2 trains per hour from Exeter, Newton Abbot and Torquay. There are connections with Plymouth and Cornwall at Newton Abbot and with London and the Midlands at Exeter. Local trains are operated by Great Western Railway who also operate a few through trains from London. 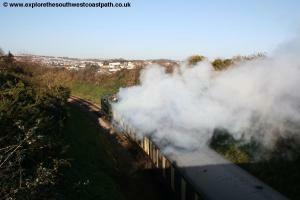 Cross Country Trains also operate a few through trains from Bristol and Birmingham to Paignton. 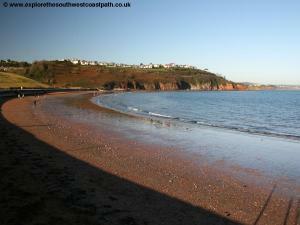 Local buses run regularly to Paignton from Torquay and Brixham, operated by Stagecoach South West. Stagecoach South West also operate a longer distance service to Torquay and Exeter which runs several times a day, route X46 and a Gold service to Totnes and Plymouth which runs every 30 minutes for much of the time. 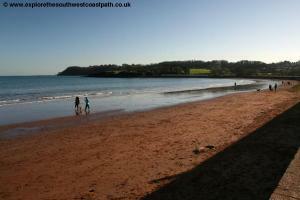 Paignton is a large resort and as a result has a large choice of accommodation from large hotels to small guest houses. 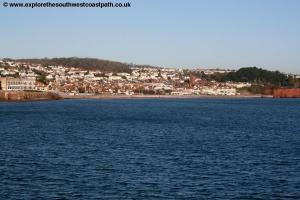 There is also a good range of self catering accommodation with several caravan sites nearby. 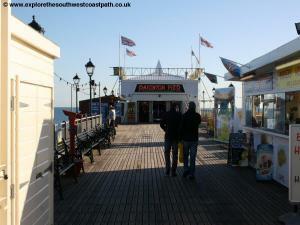 From the sea front turn right and follow the promenade. 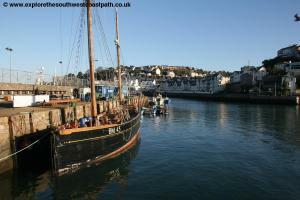 You soon reach the harbour and head under the arch past the shop to reach the harbour. At the back of the harbour, turn left and follow the south edge of the harbour, to reach a fish merchants at the end of the harbour wall. 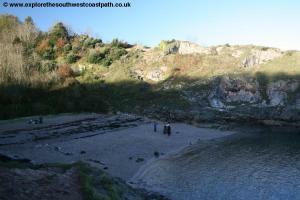 Here take the steps ahead down onto Fairy Cove. Take the steps up from the middle of the beach and head through the gardens to reach the road, then turn left along the road. At the end of the road the path goes around the gardens on Roundham Head. 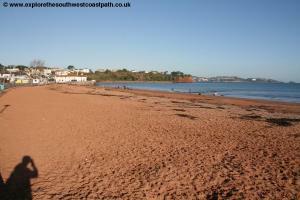 At the far end of the beach, take the zig-zag path down to the promenade alongside Goodrington Sands. 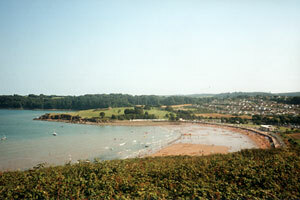 This is a large sandy beach which is very popular in the summer and has a waterpark (Quaywest) behind it. 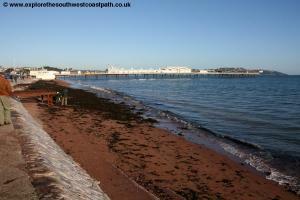 Keep on the promenade right along the back of the beach until at the south end of the beach you take the path that heads back over the railway line, now part of the privately owned Paignton and Dartmouth steam railway, that runs between Paignton and Kingswear. Once over the railway turn left on the surfaced path between the railway and the houses on the right. Soon to the left there is a bridge over the railway line, which leads to a grassy headland. 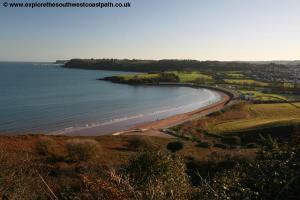 This is a dead-end path, but it does lead down to two little beaches, Saltern Cove and Oyster Bay. Keeping to the main coast path head south on the path alongside the railway onto an open grassy area and descend down to the holiday park, where there are many caravans. Ignore the path over the railway to the left and keep ahead on the path between the caravans and the railway. Soon the houses end and the path opens up into a grassy area. Take the path downhill soon reaching the end of the road, leading to Broadsands. Turn left along the tarmac track to the left, passing under the impressive Broadsands Viaduct. 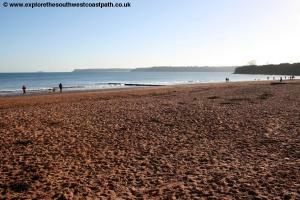 Broadsands is another excellent beach, with a large sandy beach backed by dunes. 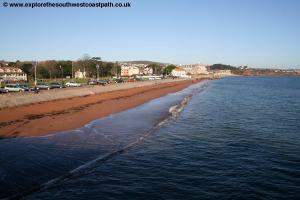 Follow the beach to it’s far end, or the promenade along behind it. 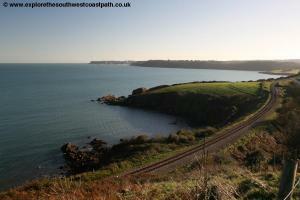 The path then heads up onto an open grassy area, Churston Point, with a golf course to the right. 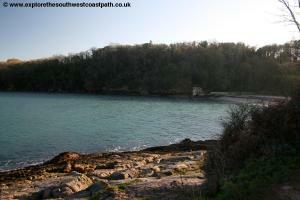 Follow the cliff top path until it enters a little wooded area and descends down to Elberry Cove. 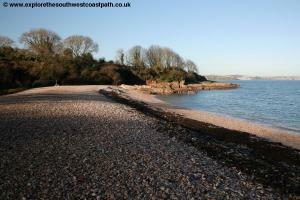 This is a shingle beach, which is secluded, unspoilt and beautiful. It is also very sheltered and has a little ruined boathouse at the far end. 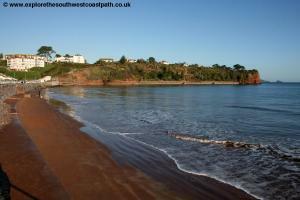 Head along the back of the beach and then take the path ahead into the woodland of Fishcombe Point. There is a climb up, but the path soon levels out and heads through the woodland, with views through the trees to the left. 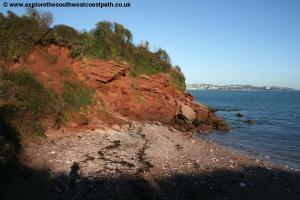 At the end of the headland at Fishcombe Point, the path descends down to Churston Cove, another secluded little beach. 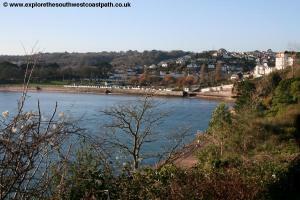 Take the path along the back of the beach and back up into a small area of woodland. You emerge onto a road and go ahead passing the houses on the left. Turn left when you come to the sign and follow this down to Fishcombe Cove, where there is another small sandy beach. 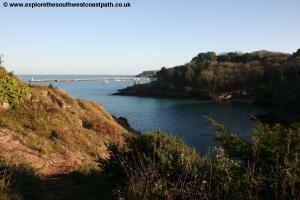 Take the coast path which leads up from the arch at the other end of the little bay and around the headland. 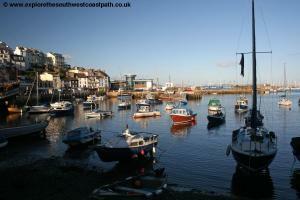 The path soon descends down to the path behind the harbour. 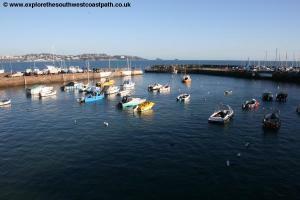 Follow the road past the car parks and boat parks to reach the large outer harbour breakwater. On reaching the main harbour ahead, turn right. 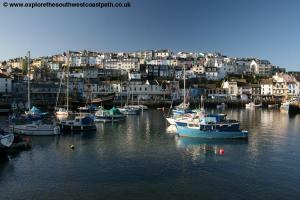 Brixham is a pretty little town centred around the large harbour, with brightly painted cottages surrounding the harbour on the hills above. 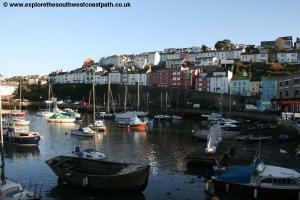 Take the path around the north side of the harbour to reach the back of the harbour. Stagecoach South West service 12 runs every 10 minutes Monday – Saturday and every 15 minutes on Sundays from Brixham to Paignton, stopping at the bus station in Paignton, which is adjacent to the railway station. 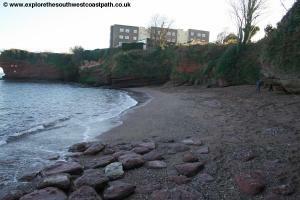 Ordnance Survey Map OL20 (South Devon) covers the coast between Paignton and Brixham and is available in shops locally and from internet retaillers nationwide. The following links also show the maps of this area.